As most of the rural people in Punjab are associated with farming, the state government has announced a special scheme for the agricultural workers. The name of the scheme is Punjab Loan Waiver Scheme. With this program, the state government will help the agricultural workers by releasing the pressure of loan from their shoulders. Empowering the farmers of the scheme – The main aim of the government is to assist the poor farmers in getting relief from the credit repayment that they have taken from the banks, for agricultural purpose. For small, marginal and other farmers – As per the highlighted features of the scheme, the monetary assistance will be given to the farmers that have a significant amount of farm land. The same benefits will also be given to marginal and small farmers. Total beneficiaries under the scheme – As per the government estimates, the scheme will provide monetary relief to almost 10.25 lakh farmers, residing in the state. 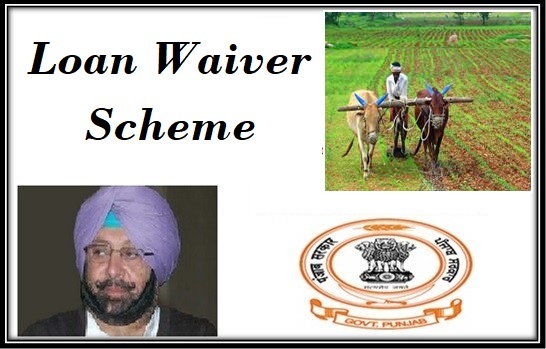 Credit waiver amount – It was announced that all the farmers, applying under the scheme will get a discount of Rs. 2 lakhs. A loan amount of Rs. 2 lakhs will be cleared. Outstanding credit amount – As per the reports of the banks and the state government, the total amount of outstanding agricultural credit amount is Rs. 59,621 Crore. Banks that the scheme enlists – All the banks that are operating under the state authority, Urban Cooperative Banks, public banks, private banks and rural banks in the specific region will be enlisted under the farmer welfare program. Number of credit accounts – As per the data that has been provided by the government, a total of 20.22 lakh accounts fall under some kind of agricultural credit. These accounts will be served as per the scheme as they are still to make the repayment of the net amount and the interest. For the farmers of Punjab – The benefits of the program will be provided to the farmers who are residing within the borders of Punjab. The farms must also be located in the state. Only then will they be allowed to apply for the scheme. Farm measurement related criteria – It has been highlighted in the scheme that only those small and marginal farmers who have farms that are less than 2.5 acres in measurement will get complete waiver of 2 lakhs. The other farmers must have a farm that measures from 2.5 to 5 acres. Phase I – The scheme highlights that all the agricultural workers of the state who have seeded their Aadhar cards with the account of the respective banks, even before the state authority published the notification, will be brought under the scheme during the implementation of the first phase of the program. Phase II – The second phase of the implementation will see the inclusion of those agricultural labors who opted for seeding the accounts with the Aadhar Card after the official announcement of the Loan Waiver Scheme was done by the state government. Phase III – Last but not the least, the farmers who had taken a credit from banks for meeting the requirements of agriculture but have not seeded the Aadhar card with the bank account number as of now will be brought under the scheme. As the scheme has been launched recently, not much has been declared about the application process. But if online process is started, and then the applicants will be able to get the application form will be available from the authorized website of the scheme. For now, the registration forms can be acquired from the office of the respective District Commissioner. The state government has not declared anything about the registration procedure of the scheme. It can either be via offline or online procedures. As the respective departments take the decisions, the common farmers will be notified via the press. Residential proof – Due to the exclusivity of the welfare scheme, it is mandatory for the applicants to attach proper residential papers with the application form. It will assist the verification officers to make sure that only the residents of the state are getting the benefits. Documents of the land – To support the claims that the applicant is actually a farmer and has a farm that falls within the criterion, the attachment of papers of the land are also a must. It will make things easy for the verification authority. Documents of the credit – The papers and documents, issued by the banks, while the agricultural loan was acquired must be provided for verification as well. Details of the account – As the loan waiver will be done via the respective bank account of the farmer, the details of the bank, the branch, the account number and other associated details must be provided by the applicant. Aadhar Card – The Aadhar card is mandatory for getting the benefits of any state or central government sponsored schemes. So, all farmers who desire to get the credit waiver need to possess the Aadhar number. Identification details – The applicant must provide all personal details like name, contact details, district and name of village. These must be filled in the application form and any errors will lead to the disqualification of the application. Making sure that only the needy and eligible candidates get the benefits of loan waiver is a must. Thus, all applications will have to go through rigorous verification procedures. Only those applications, which manage to pass every scrutiny, will get the loan waiver. The administrational operations of every district are looked after by a deputy commissioner. He will have the responsibility of forming a district-level committee that will pin point the farmers who are eligible to get the benefits of the scheme. Once the identification process is complete, the state authority will have to form separate camps in all the districts and respective blocks. These camps will also be set up in the respective banks. The task of the officers in these camps is to give certificates to the agricultural workers, thereby informing them that they no longer have to worry about the repayment of the loan. The implementation of the scheme is very elaborate and one can have any doubts about the process. Apart from this, proper monitoring of the scheme is also necessary. To look after these aspects, a monitoring committee will be formed. There will be 11 members in the group and they will report the progress to the Chief Secretary. The state authority has announced that all banks will be brought under the scheme in due time. The implementation of the program will start with including the farmers who have accounts in the cooperative banks. Once all such financial institutes have been covered, the state authority will shift their target towards the banks that fall in the public sector. Finally, the farmers who have opted for agricultural credit from the private banks, will be targeted for the loan waiver. As per the information given by the state government of Punjab, it will require a large amount of money to provide the benefits of the program to such huge number of beneficiaries. A total allocation of 400 crore has been done by the state authority. The money will be utilized for providing monetary respite to all the farmers who have taken any kind of credit to meet the requirements of agriculture. Farmers in Punjab are being ensured by the state government that only the most deserving ones will receive support from the state’s debt waiver scheme. This comes as a new self-declaration requirement has been put into place. This is to ensure that government employees and pensioners do not try to take advantage of the scheme. The scheme is designed with small landowners in mind. The effort being produced will help ensure that smaller farmers can get the funding they need for their actions. But this also comes amid concerns that other farmer with massive properties have tried to take advantage of the debt waiver scheme. Also, there are concerns over how waivers of loans might be imposed upon farmers who have committed suicide. Independence Day was celebrated with pomp and grandeur in Punjab. Apart from the celebrations, people also got new announcements from the state government. Earlier, the state has launched a unique loan waiver scheme for agricultural workers. The CM flagged off the second phase of this scheme on 15th August,. Apart from this, CM also declared that special campaigns will be started to create awareness among the youngsters about drugs. The anti-drug campaign will ensure that youngsters stay away from misuse of substances. There are around 118 OOAT centers operating in the state. Another 14 clinics will be started as soon as possible.